This is a very interesting article, especially if you find you have a health problem that you really cannot understand why or how. Look at water that you are drinking. The water that you are consuming may be your problem. Try changing you supply of water and see if it makes any difference to your health. It could be many things like depression – (you don’t know why you feel this way). Stomach ache – done tests and find no problem. Headaches – find no results in tests why you are having headaches. The list can go on and on. Once again look at the water you are drinking. You could call this a sales pitch I guess but I am such a believer in the K8 Kangen water machine that I believe it should be on your Christmas list or at least your New Year list to improve your health. I do not promote anything unless I have tried it and I have had my machine for over a year now and I cannot recommend it enough. The water streaming from the water fountain isn’t as safe as we believed when we were children: it could be cutting days from our lives. In fact, there are countless compounds (1) that are present in toxic water wells all over the world. The problem isn’t isolated to developing countries. The tragedy in Flint, Michigan proved that we need to re-examine the water we are drinking right here at home. Cancer-causing agents that have recently been reported in high levels within nearly 30 water wells in Harris County. (2) These compounds are detrimental to human health (3) because they cause reproductive and developmental problems because they target the immune system, keeping your body from being able to heal properly. Our water, toothpaste, and mouth rinses have been fluoridated for decades, and because it is believed to prevent tooth decay, does not relinquish the harm it causes to your body and brain. A study (4) conducted at Harvard’s School of Public Health not only concludes that fluoridated water lowers children’s IQ, but it also greatly hinders neurological development. Fluoride proponents have justified its use for years because of ‘oral health benefits,’ but the tax it is taking on your brain is not worth it! There is also research (5) stating that there was actually a decrease in dental decay after fluoride was removed from water in East Germany, so why is this poison still being added to drinking water all over the world? There is even a link to increased bone tumors, or osteosarcomas, that were present after fluoridated water was introduced to a population of rats. A terrible outbreak of flesh-eating bacteria has gripped the Southern coast of the United States. Flesh-eating bacteria, or vibriosis, are present in beaches that come in contact with the Gulf of Mexico. If you have open wounds, it is heavily advised to stay out of waters that could be contaminated with this deadly bacteria. It can also be contracted from eating contaminated raw seafood. If you believe you may have been exposed, it is best to act promptly by contacting paramedics immediately, as these deadly toxins spread rapidly, leaving dying tissues behind. You can monitor recent outbreaks that have been in America(9) and in Northwest Spain(10), so be cautious if you are visiting Galicia, Spain, or Florida, Texas, and Louisiana in the U.S. this summer! There are dozens of toxins that are present in our sinks, showers, and water fountains, but who would have guessed that there are even heavy metals that are floating around completely invisible to the naked eye? The best way to prevent these contaminants from making their way into your body when cooking, showering or drinking the tap water (which we do not recommend) is to choose cold over hot water since lower amounts of lead are present, and opt for filtered, purified, or distilled water. Remember that not all bottled water is safer than tap water! Here is a list (11) of the worst 35 contaminants, *internal scream* with a summary of how they are slowly killing you. Follow these helpful tips (12) to naturally detox your body and brain if you already have been exposed to a toxic level of heavy metals. Zinc oxide is made from zinc, a type of metallic element found in nature. Like other elemental metals, including iron or electrolytes like magnesium, zinc is able to carry a certain electric charge that gives it special benefits within the body. Zinc Oxide has a benefit to the immune system, digestive tract, brain and skin. It is a “building block” for protein synthesis, enzyme creation, and metabolic processes. Zinc oxide is not naturally occurring, but rather created when zinc is chemically heated and combined with oxygen molecules. The two elements are vaporized, condensed, and formed into a powder that is fine, white, crystallized and sits on top of the skin providing a protective layer. Zinc Oxide as I know it always left a white creamy film on your face when applied but now with an advanced formula this is not so and is now more widely accepted as a sunscreen. I personally have been a little dubious of a lot of the sunscreens as they have some quite toxic chemicals in the ingredients. On the other hand Zinc Oxide is a natural alternative that has been proven to be beneficial to the skin at the same time giving it protection from the elements. Zinc is a mineral and has the ability to sit atop the skin and scatters away the ultraviolet rays. Due to the Zinc’s ability to do this you will probably find a small amount in most commercial sunscreens. Most chemical commercial sunscreens include the ingredient oxybenzon which is said to irritate the skin because of its toxicity. Most commercial sunblock only protect you from either UVA or UVB rays, but not both types, hence more toxic chemicals are added to try to stop the sun burn. Zinc oxide is a substance created from zinc and oxygen which is usually found in powder form, but added to many lotions, ointments, sunscreens and rash creams. Zinc oxide has been found to have natural antiseptic and antibacterial abilities. Other benefits include healing epidermal wounds, burns, rashes, skin oiliness, infections and acne. Unlike many chemical sunscreens, zinc oxide protects against UVA and UVB light rays and is often used as a natural, non-toxic sunscreen to prevent burns, signs of photo-aging and irritation. So when you next look at buying a sunscreen or actually changing your sunscreen immediately it is worth looking for a good Zinc Cream. The cream that I use and the family use is the ‘Invisable Zinc’ product which came recommended to me. You are able to purchase these on Amazon. Giant hogweed (Heracleum mantegazzianum) is an invasive herb in the carrot family which was originally brought to North America from Asia and has since become established in the New England, Mid-Atlantic, and Northwest regions of the United States. Giant hogweed grows along streams and rivers and in fields, forests, yards and roadsides, and a giant hogweed plant can reach 14 feet or more in height with compound leaves up to 5 feet in width. 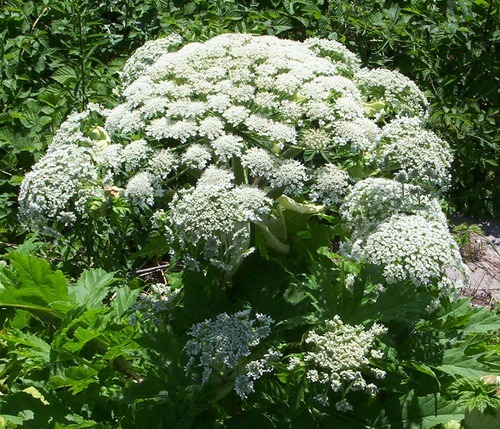 Giant Hogweed sap contains toxic chemicals known as Furanocoumarins. When these chemicals come into contact with the skin and are exposed to sunlight, they cause a condition called Phytophotodermatitis, a reddening of the skin often followed by severe blistering and burns. These injuries can last for several months, and even after they have subsided the affected areas of skin can remain sensitive to light for years. Furanocoumarins are also carcinogenic and teratogenic, meaning they can cause cancer and birth defects. The sap can also cause temporary (or even permanent) blindness if introduced into the eyes. 3. 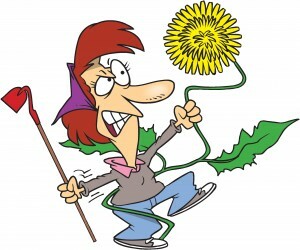 Cover up weeds – Save money on weed killers by spreading several layers of newspaper on the soil before mulching over them in the garden. This blocks weeds from growing and it helps retain moisture, so you save even more by needing to water plants less.